When the United States entered WWI, sheet music was very popular on the home front and a new form of pop music called “jazz” was beginning to emerge. Families, neighbors, and friends would gather around pianos to sing their favorite tunes popularized by larger-than-life vocal stars. 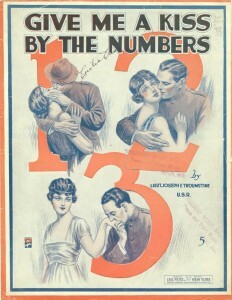 The Wisconsin Veterans Museum has many examples of WWI sheet music, each with elaborate colorful covers. Other songs reflect anxieties families felt with their soldiers away at war, like “Send Back Dear Daddy to Me” featuring a young girl staring longingly at a photograph of her father in uniform. Many American soldiers traveled overseas for the first time and flares or foreign culture showed up in American sheet music. 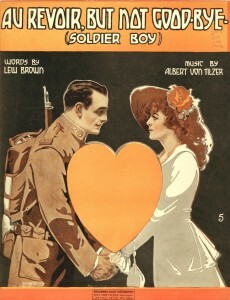 Some songs featured lyrics in French like “When Yankee Doodle Learns to Parlez Vous François”, with cover art featuring an American soldier escorting two French Cancan dancers. The sheet music of WWI offers a unique look at the consciousness of the United States as it went through social changes and began to emerge as a major world power. Interested in viewing the Museum’s collection of sheet music? Schedule your appointment today!